The examination of the Future knowledge base considered how best to empower the learner. NATO defence education should be founded on a simple principle – ensuring the learner knows and understands all that is needed at every level of command to be mission effective. Exploiting research was central to a learner-centric approach to the strengthening of research skills. Future learning considered learning outcomes with an emphasis on creating expanded opportunities for learning success. Output based education is the standard in the business world and the conference looked at how best to exploit such experience. The role of security education and the broader context of defence education was also considered, together with the critical role of lifelong and enduring learning. The utility of technology was essential for effective distance defence learning. E-learning is as much a part of the future as the classroom. To that end a much better understanding is needed by both educator and learner as to the utility, possibility and, indeed, limits of technology. This included how to better exploit the information environment. The value of personal interaction was also explored and the development of sound academic programmes remained central to the ethos of defence education. Future leaders and defence education looked forward. Promoting leadership is one of the central tenets of defence education; sound military leadership is built on the ability to make a good decision reflectively. Thus, military professionals need abstract as well as practical knowledge if they are to be equipped for dealing with complex contingencies. 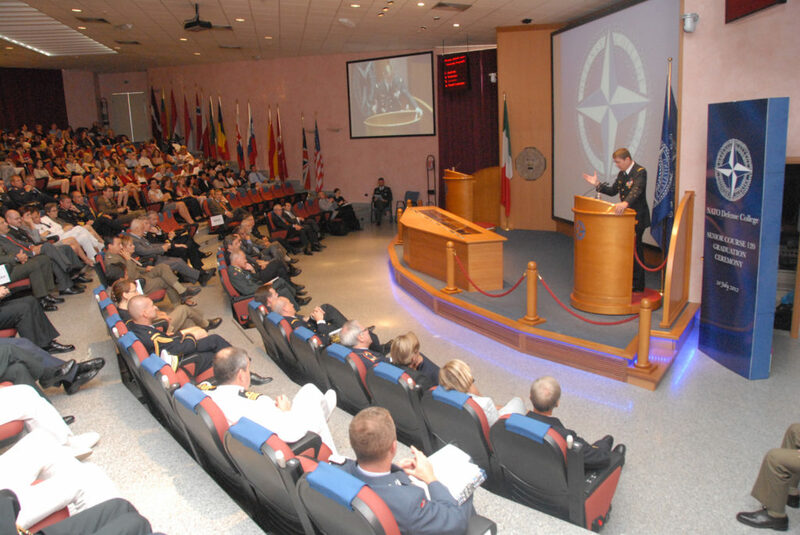 The conference closed by considering NATO education standards; the balance to be struck between knowledge, invention and convention in the future military leader and extending the military-academic partnership to realise the transformation implicit in the Connected Forces Initiative. The essential dilemma of professional military education (PME) is that it supports shrinking institutions dealing with bigger issues over great time and distance, requiring ever more complex partnerships to succeed in difficult missions. Three specific strategic challenges face PME: the setting of goals for education, training and research in a shifting strategic environment; the relationship between PME and the rapidly-changing civilian academic market, which in turn raises profound questions about academic freedom and access to top-quality civilian expertise; and the growing gap between the generation and use of technology in education and training. History suggests that it is precisely at such hard economic times that education should be seen as a key enabler of the human capital that is the comparative advantage of NATO militaries. The transformation of armed forces must be linked to the transformation of PME. Instead, across the Alliance PME is being systematically cut as the medium to long-term is abandoned in favour of the short-term. There are balances to be struck between education and training, the war-fighter and the wider security community, and the national and the international in PME. However, there are no insuperable barriers to strategic unity of effort and practice in PME if sufficient will can be generated to inform a much needed Alliance defence education vision. Indeed, making smart defence smarter should be the daily mantra of all concerned in the Alliance with delivering an outcome-based, learner-focused system of education and training. Education and training must be seen as part of a holistic whole. Education merely provides the context for training. Education will vary according to level and capability and be tailored to support careers that specialise in many security domains. For example, at the mid-level education will produce “brilliant mechanics”, whereas at the higher-level it will reinforce “strategic level intuition”. The PME system must be agile enough to recognise early and support “the likes of a Petraeus or Stavridis” as well as more modest mortals. Critically, central to PME will be a tailored, career-long learning relationship that can identify early talent and foster an elite of officer-scholars, some of whom are sent off for a time into the civilian education sector with no suggestion that their careers will be blighted as a result. Advanced distance learning (ADL) will be an essential part of future PME as will other technologies currently informing the revolution in civilian education. Consequently, the balance between residential and remote course is likely to change. However, an essential paradox must be confronted to exploit both technology and the information to which it affords the learner access; as academies are cut the greater reliance on ADL could generate demands for increased access to information to service online learning that will simply prove beyond reach. PME could then be reduced to a kind of defence Wikipedia – strong on information, uncertain on quality. However, perhaps the real challenge is to convince commanders of the value of learning and thereafter that time should be invested in it. Given the nature of emerging security challenges and the austerity which is the ‘pot-mark’ if not hallmark of this age, no single actor can afford or guarantee security or defence. That is why a community such as NATO exists. And, whilst much of the PME effort will take place at national level it is precisely those communities able to champion strategic unity of effort, purpose and knowledge in this age that will prevail.